Over 300 pamphlets have been delivered to creative industry workers at the top 25 agencies across England this morning as the anti-advertising movement Brandalism launches its ‘Advertisers Anonymous’ programme. After successfully hijacking 600 advertising spaces in Paris last December on the eve of the COP21 Climate Summit, Brandalism is now actively recruiting members from inside some of the world’s most recognised advertising and communications agencies. The agencies targeted include Saatchi & Saatchi, Adam & Eve DDB, AMV BDDO, Ogilvy & Mather, Mother and Wieden+Kennedy. This latest intervention from Brandalism subverts the common industry practice of direct marketing by targeting individual ad agency workers including copy writers, creative directors, account managers and brand strategists across London and the country. 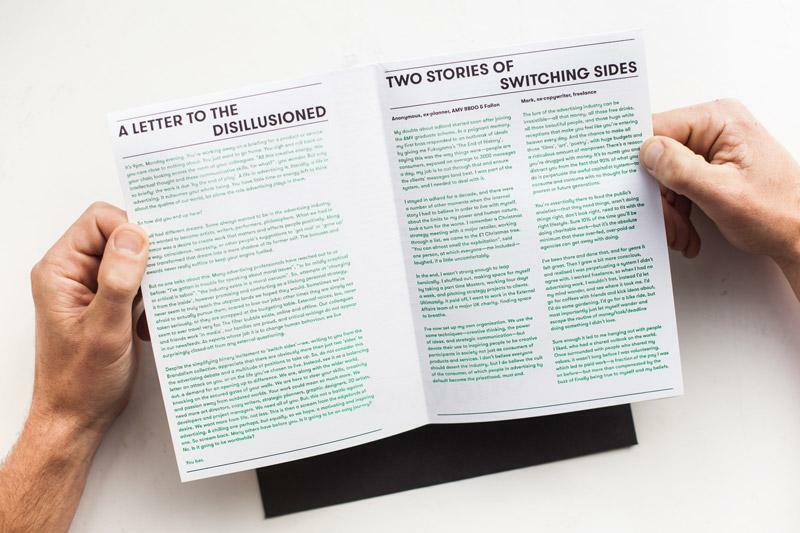 The riso-print pamphlet features stories and practical advice by ex-industry workers from Saatchi, WPP, Fallon, and AMV BBDO on ‘How To Switch Sides’ and apply your creativity in different sectors. The personal stories highlight the recognisable moments of joy and despair that workers in some of the world’s most renowned agencies have experienced and highlight the morally bankrupt culture of the advertising and public relations sectors. The fold out pamphlet entitled ‘Advertisers Anonymous - A Guide to Switching Sides’ was designed by a world renowned creative agency. 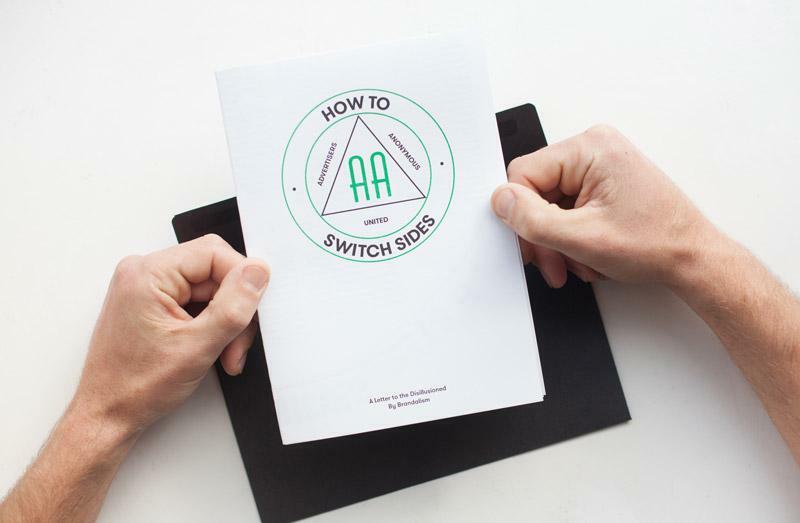 The design subverts the brand identity of Alcoholics Anonymous, and presents Brandalism’s ‘5 steps to Switching Sides’. It is accompanied by an invitation to attend the world’s first ‘Advertisers Anonymous’ event in London on 24th November. 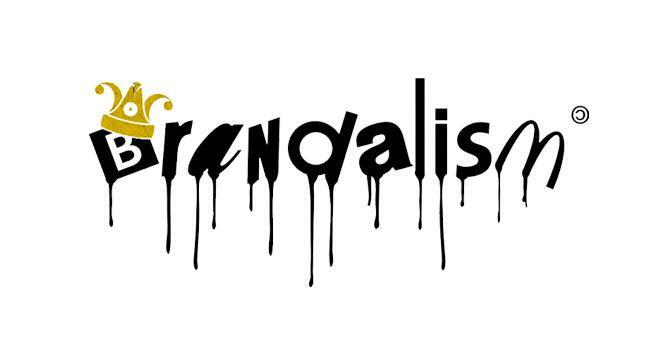 Bill Posters from Brandalism said, “The first step on the road to recovery is to admit that we have a problem. Almost the entire world is now addicted to consumerism. The values and messages that are constantly repeated and normalised through all forms of advertising are exacerbating the issues of climate change, environmental destruction and social crises. The ad agencies are the dealers that use the incredible creative talents of their workers to feed this addiction to consumerism, regardless of the costs. So we are reaching out to them, to further develop a conversation we started earlier this year with disillusioned industry workers.“ “We want to connect with workers, and explore the personal, social and environmental costs of this sector, and what we can do about it - for ourselves and our well-being, for society, and for the environment.” Cynthia Peters, ex advertising worker and member of Brandalism said “I found the advertising sector exists in a moral vacuum, closed off from external critique whilst simultaneously externalising the social and environmental costs that consumerism is responsible for. Some of the brightest creative minds are working on briefs right now for brands that are socially and environmentally destructive. Others who are interested in changing things from the inside feel blocked, incapable of making the changes they would love to see. Our creativity could mean so much more. We want to connect with others in the industry to see what we can create together.” The world’s first Advertisers Anonymous event will be held at a secret location in central London, more information and tickets to the event are available on the Brandalism website. #AdvertisersAnonymous.